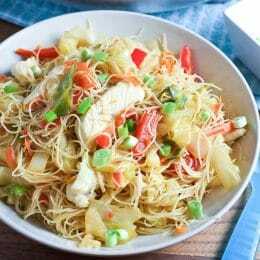 Filipino pancit is a delicious noodle and veggie stir-fry that is quick, easy, and pleases a crowd. 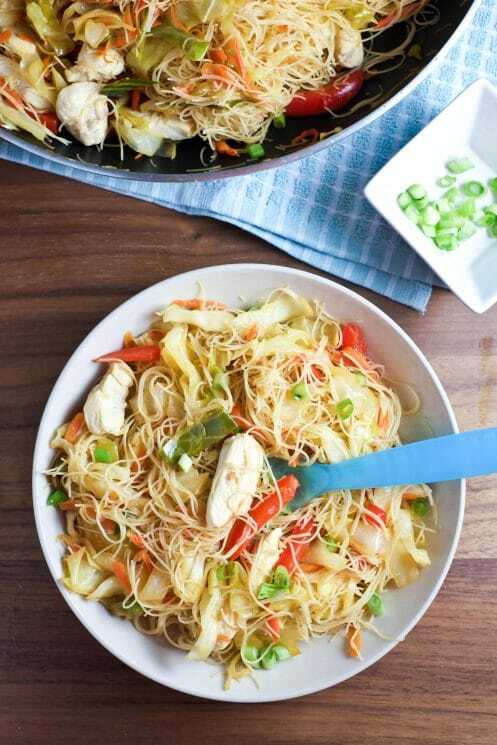 Make it with chicken with cabbage, bell pepper, and carrots for a traditional version, or swap in your family’s favorite veggies and proteins. 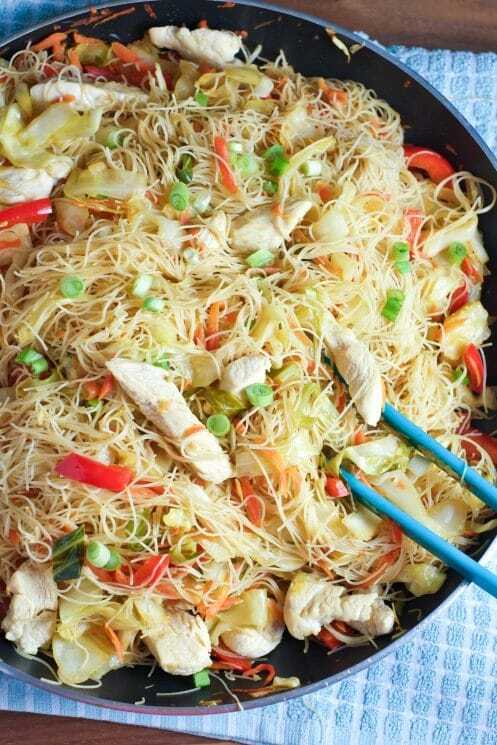 My family made pancit all the time growing up. We learned the recipe from some close Filipino friends and it became a regular in our recipe rotation. You’ll see what I mean when you make it. It’s delicious (almost addicting) and really simple to make. You literally need less than ten ingredients, and nothing expensive. 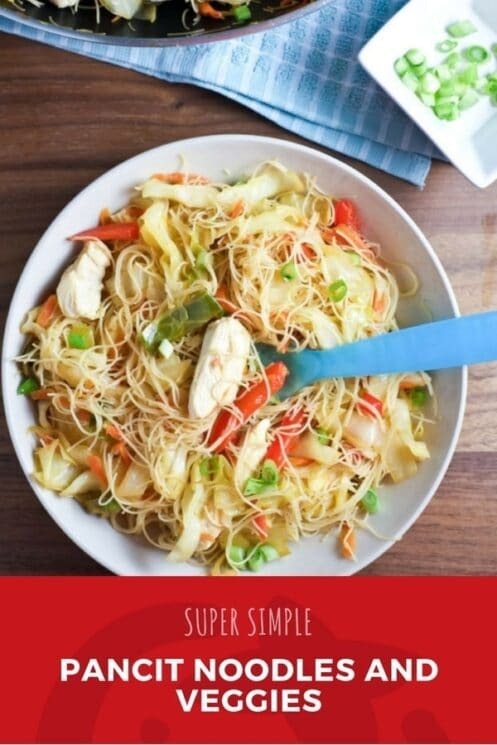 It cooks quickly and makes a lot, so you can feed a larger family or have leftovers! 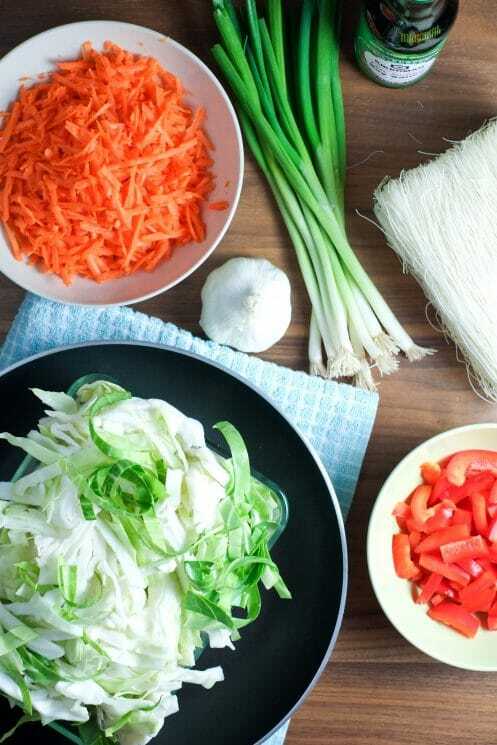 I was taught to make pancit using cabbage, bell peppers, and carrots – but really you can use whatever you like! It would be great with broccoli, zucchini, or peas. 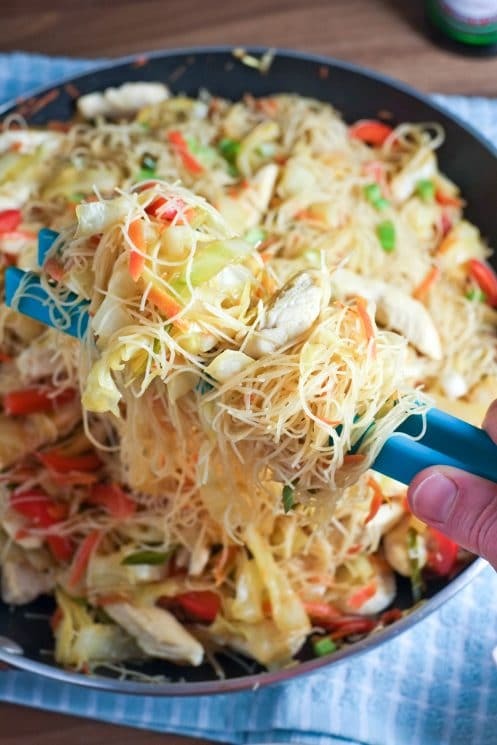 Pancit is also frequently made with various proteins – pork, shrimp, chicken, or combo. Here we used chicken, but you can use any meat or even leave it out altogether. As with most recipes, start by prepping. Slice chicken, shred cabbage, cut peppers into matchsticks, and grate carrots (or just get matchstick style and save yourself some work!). It’s going to seem like a lot of veggies, but somehow they disappear into the noodles once it’s cooked. You’ll hardly notice you’re getting in so much good stuff! Now you’ll need to soak the noodles. I used vermicelli rice noodles, though I have pancit using other types of noodles. Place the block of noodles into a bowl of hot tap water for 15 minutes. After the first minute, use kitchen shears to cut the block in half so the noodles aren’t miles long… unless you want that, of course. Once they’ve soaked for 15 minutes, drain them. Meanwhile, heat a wok, very large pan, or even a pot over medium-high heat. I used a large pan because I don’t have a wok, but next time I’ll use a pot so I don’t spill as much. Add 1 tablespoon of oil to the pan and then add in sliced chicken and garlic. Saute until the outsides are no longer pink, then add all your veggies. It’s going to be really full! Cook veggies, stirring frequently, until no longer raw and shrinking in size a bit. This will take close to 10 minutes. Next, add the soaked and drained noodles. Fold the noodles and veggies together, trying not to chop the noodles up too much. ﻿Now pour in the soy sauce (always use low sodium if you can!) and mix everything to evenly coat. Allow this mixture to cook for 5-10 more minutes, until everything is cooked and heated through nicely. Add more soy sauce if desired, to taste.Serve warm with green onions for garnish. Some lemon slices squeezed on top add a bright freshness. Enjoy! Slice chicken into thin strips. 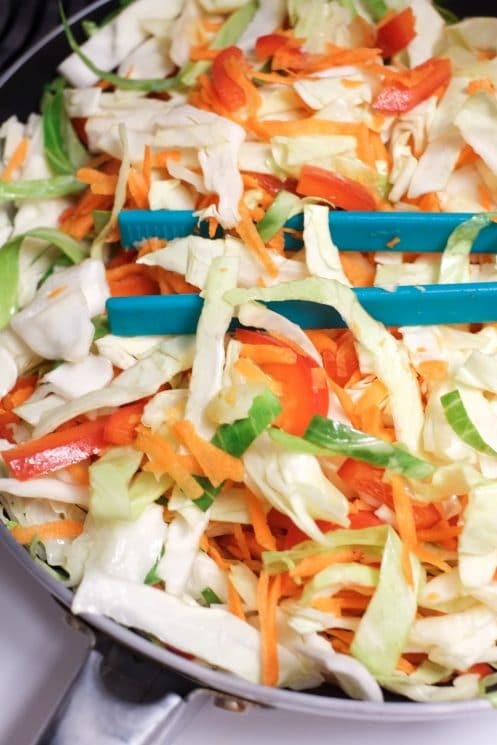 Mince garlic, shred cabbage, cut peppers into matchsticks, and peel and grate carrots. 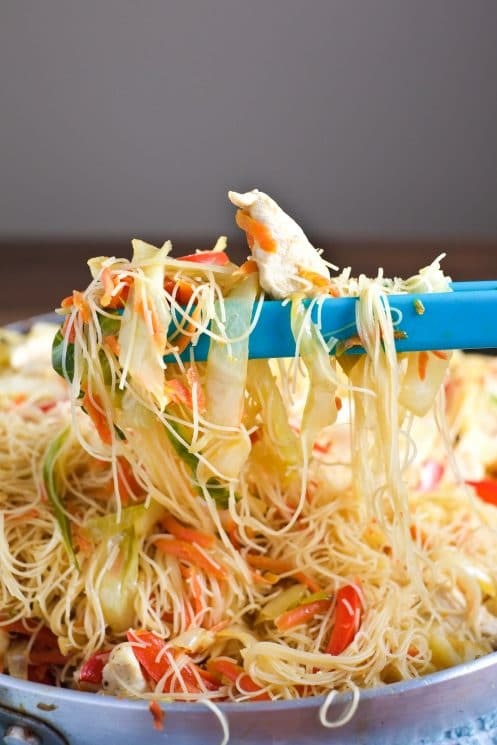 Soak vermicelli noodles in hot water for 15 minutes. Use kitchen shears to cut the block of noodles in half after soaking for a minute or two to keep noodles from being excessively long. In a wok, large pan, or pot, heat oil. Add chicken and garlic and saute until chicken is no longer pink on the outside. Add veggies and stir. Saute for 10 minutes, until veggies are softened. Drain noodles after 15 minutes and add to the veggies. Carefully fold everything together. Pour soy sauce over everything and continue stirring occasionally for 10 minutes. Serve warm, topped with chopped green onions. Add more soy sauce to taste. i need to add this to my recipe box but how? Hi Fenina! I’ll add it to our recipes so you can add it to your recipe box! It should be up in a day or two! Thanks! Hey there! I never tried this type of noodles before, but your pics look so delicious that I have to try. I’ll come later to let you know how they turned out. Thank you! Please do! Hope your family loves them. Can you tell me sodium count?